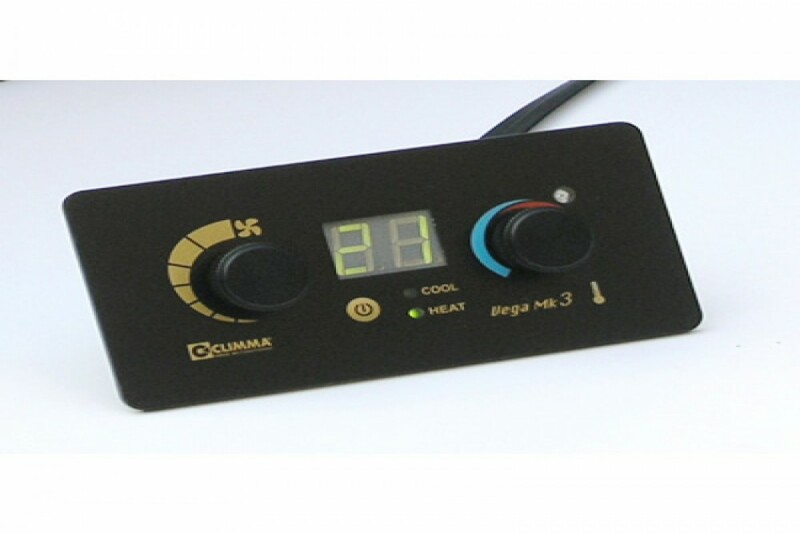 Control panel for air-conditioners Climma Compact and Split MK3. Temperature and blower speed settings with easy-to-use rotating knobs. Single ON / OFF push button. Large digital display with indication of the ambient temperature. The display indicates the blower speed or the temperature set point as any of the two rotating knobs is moved. Automatic dimmer on the digital display by means of an ambient light sensor. 2 function modes: auto mode, auto mode advanced and dehumidification. Temperature sensor incorporated in the panel. Optional remote sensor. 8 manual speeds plus auto mode. Memory of the user settings.